For the most part of my cooking life, I have shied away from baking. Since I happen to be a strict vegetarian who does not eat eggs, I grew up with a strong mental block toward baking as real baking to me, was non-existent without eggs. And with a similar lineage to boast of, there was no one to tell any other way. Besides, I had written off baking as something ‘not my cup of tea’. No wonder, for a person who’s cooking instincts are driven mostly by approximation and eyeballing. But, years later it so happened that one fine day out of the blue, all I wanted to do was bake. Can’t recall if it was my hard-to-please toddler or my foodie husband who kindled my baking desire, but google surely added fuel to this blazing fire. Not only were my hard clenched myths busted, I also learnt the endless possibilities of eggless baking through a number of dedicated bloggers. Since then and now, I cannot seem to stop thinking about it – I wouldn’t be writing about Peach Cobbler here, otherwise! I am glad to be portraying a different story today, to have discovered baking in the new light ‘cos the joy it brings to my heart, the chef in me can only dream about. The first time I ate Peach Cobbler was when Al, wife of K’s childhood friend baked it during our visit to see their newborn in Phili early spring, this year. In her earnest effort to take great care of our egg-free food preferences, she had chosen this dessert recipe. 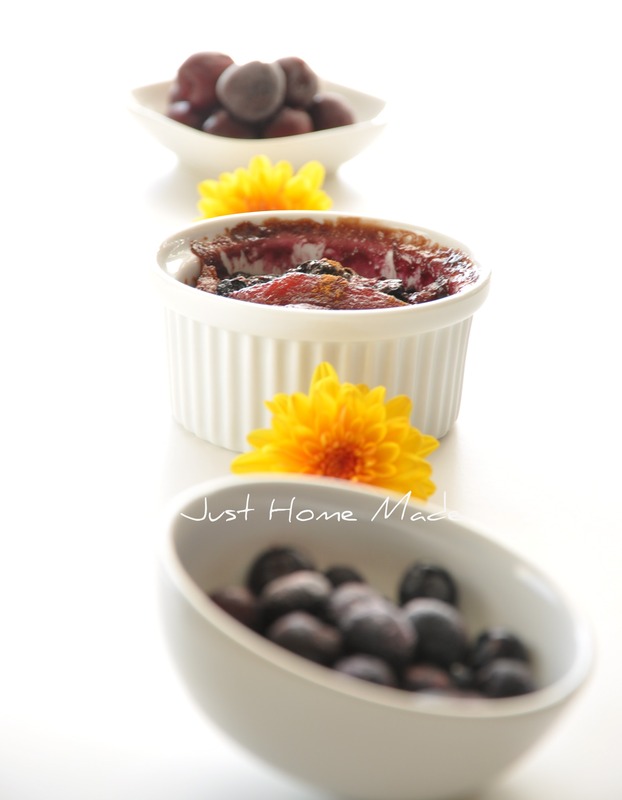 With nothing more to say, I had taken to it almost instantly and also got the recipe from her right away. But it took a whole summer long wait and Thanksgiving for me to finally bake it – A warm summer dessert to welcome winter! Needless to say, it was a big hit that left us asking for more. So, when it came to sending our dessert entry for his christmas potluck lunch party at office the other day, it was none other than this Peach Cobbler that topped my mind. Baking is a magical art in itself and a lot of science coupled with it. If the strict measurements aren’t followed to the ‘T’, the alchemy of turning batter to cake morphs into a kitchen experiment gone awry. The best part about baking is not in the baking, but in the feeding of others thereafter. And the worst part, is the need to balance relishing with moderation ‘cos a slim waist and a lot of baking aren’t a couple made for each other. Just remember this simple rule of thumb for baking, “Dry (ingredients) first, wet later”. Now let’s go bake that Peach Berry Cobbler.. In all due respect for Paula Deen, if you have watched her show on Food Network, you’ll know why I have reduced sugar and butter in half. No wonder America is an obese nation! 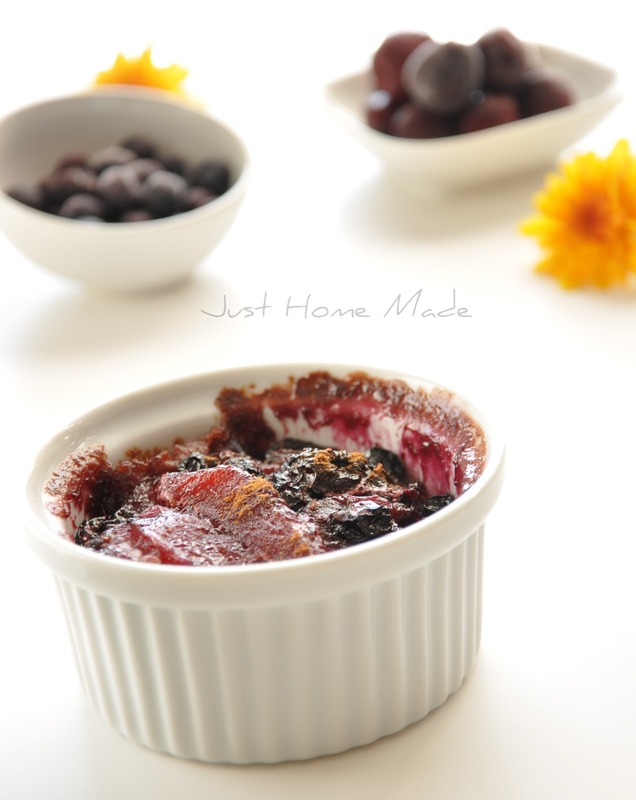 I had only two cups of frozen peaches, so I added a cup each of the cherries and blueberries. I wasn’t kicked about buying self-raising flour only for this bake. Besides, I do not use all-purpose flour, so substituted with 100% whole wheat flour (yes – same as chapati atta), baking powder and salt. I used natural cane sugar instead of refined white sugar. 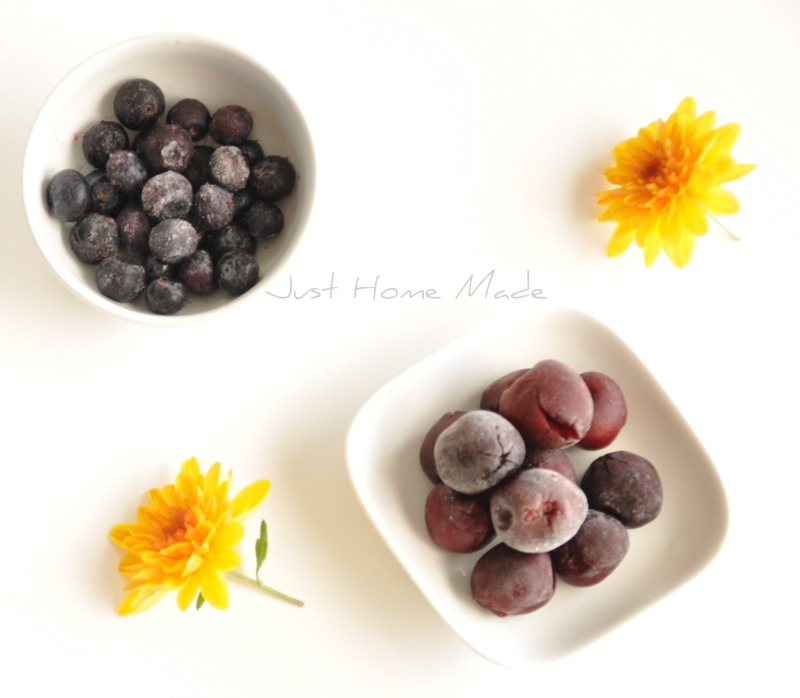 If using frozen fruits like I did, thaw by placing the frozen bags on the counter for about 30 mins or microwave as per microwave re-heating directions. 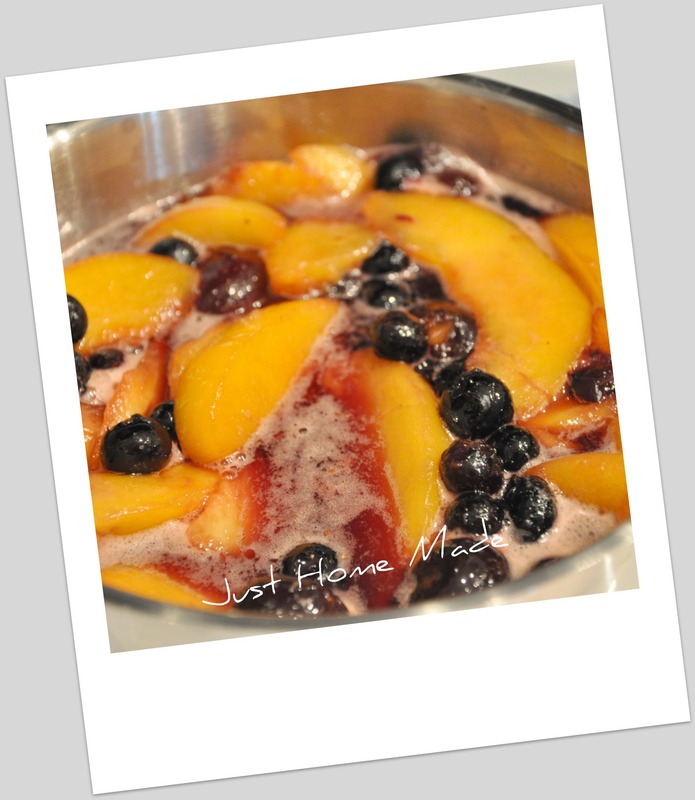 Combine the thawed peach slices, cherries and blueberries in a saucepan along with 1/2 cup cane sugar and 1/2 cup water to mix well. Bring to a boil and then simmer for about 10 mins until the liquid is syrupy and keep aside. Place butter in a baking dish (I used a 9″x7″x3″ rectangular dish) to melt in the oven or the microwave. In a large mixing bowl, whisk together the flour, baking powder, salt and the remaining 1/2 cup sugar. Alternatively, you can also sift the flour to aerate. Now gently whisk this mixture with the milk to avoiding any clumps. Do not over mix at this point. Gently pour this batter over the melted butter in the baking dish without stirring the butter. Batter will rise to the top while baking. Spoon cooked fruit on top gently pouring the syrup as well. If you feel, there is just too much syrup, keep some aside to drizzle on top before serving. Sprinkle ground cinnamon (if you chose to) over the top and bake for 40-45 mins or until a fork slid inside comes out clean. Serve warm with fruit syrup (kept aside) drizzled over and/or with a dollop of vanilla ice-cream on the side. When buying baking powder, always choose one that is aluminum free. Rumford is the most popular brand and I found it in WholeFoods store. As much as I loved the Peach Cobbler with a splash of blueberry and cherry colors, I would have loved to have the sunshine golden-yellow of the peaches intact. So next time I bake this, I probably will consider cooking the berries and peaches in sugar separately. In case you wish to reduce the butter further, try substituting 2 tbsp butter with 2 tbsp flavorless oil of your choice. Not that I am a big butter supporter, but not sure of the end result if/when butter is substituted entirely. Thank you for such a lovely entry. Keep them coming. You take beautiful pictures. Even when I do not eat eggs, it doesn’t stop me from using it to bake and feed others. Weird, I know. Champa, you are most welcome. So glad about your maiden visit here! 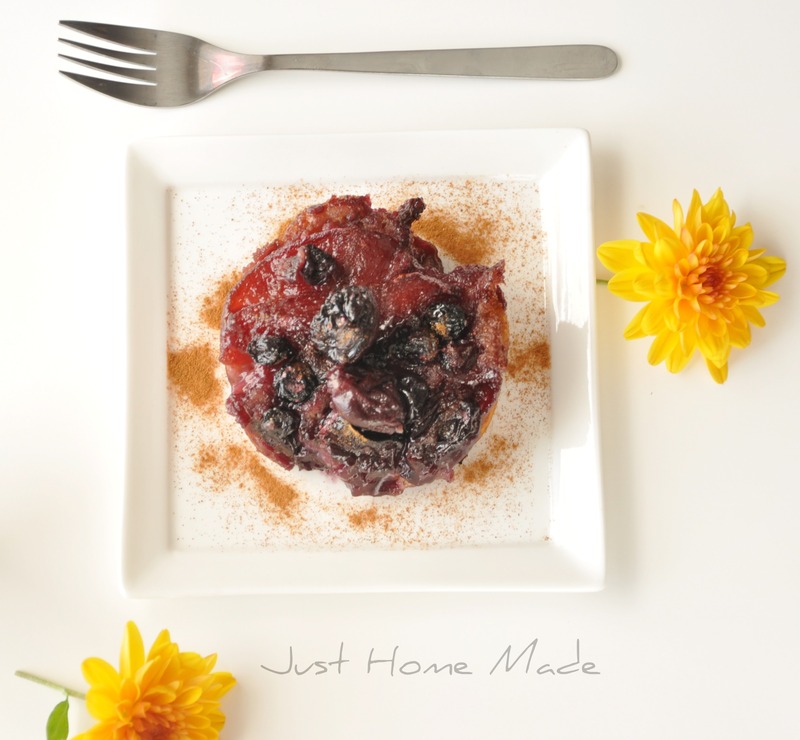 This is a perfect dessert made with healthy ingredients! Using whole wheat flour for baking is a great idea. 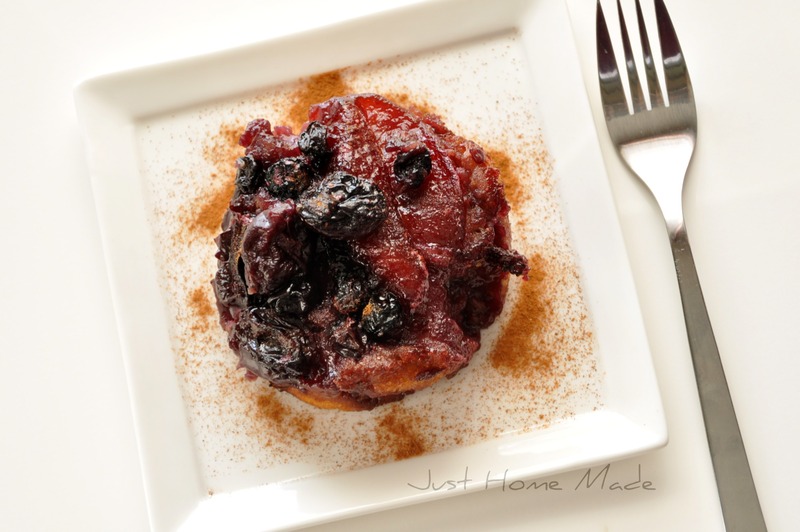 Thanks for sharing this wonderful recipe. Awesome! Bookmarked! Got the link form Champa’s Bake Off! Will be here often! Interesting. I hope to read more from your blog! I’m gonna try this recipe soon. This is exactly the type of healthy dessert I crave after the holiday indulgences. I also really miss summer fruits this time of year, and using the frozen variety is the next best thing. Great recipe! Thanks for stopping by. I’m so glad you liked the recipes. Hope you give them a try. PS: Not to mention, I also started baking to please my little one (who at that time was too tiny to be impressed anyway, she is 22 months old now).